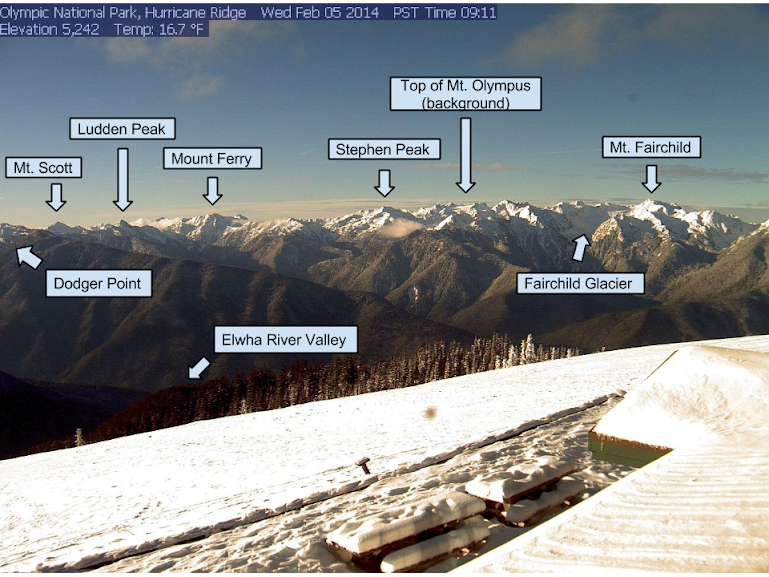 The Hurricane Ridge Webcams are mounted on the Hurricane Ridge Visitor Center near Port Angeles, Wa. They gives you a high resolution view, almost as if you were hiking into the Olympic National Park interior. Generally, the camera system can be viewed year around. My favorite time to log on, is when big storms move through the area. The Olympic Mountains are pretty amazing to look at. Make sure you bookmark this page and come back anytime! I have featured on my page a current live webcam and a cheat sheet below with the names of all the peaks you are looking at. What Mountains are You Viewing? Most of what in sight is actually a section of the Bailey Range. That range is a series of mountains that run almost the entire length of the Park; from North to South. Mount Olympus hides behind that range, just to the west. From left to right: The flank of Dodger Point, Mount Scott, Ludden Peak, Mount Queets, Mount Meany, Mount Ferry, Stephen Peak, Mount Olympus, Mount Carrie, Mount Fairchild and Mount Fitzhenry. I often use the internet to monitor snowpack, weather patterns or even just to daydream about being in wilderness. It's amazing how with one click, a person can be visually transported into the mountains. I think we are pretty spoiled this day and age to have this option. I don't know how many web visitors use the National Park cam daily, but I'm sure it's in the hundreds. Interested in learning more? Check out my trail guide suggestions.